Walk Into Luxury offers a unique walking experience along the stunning Cape to Cape track in the Margaret River region of Western Australia. 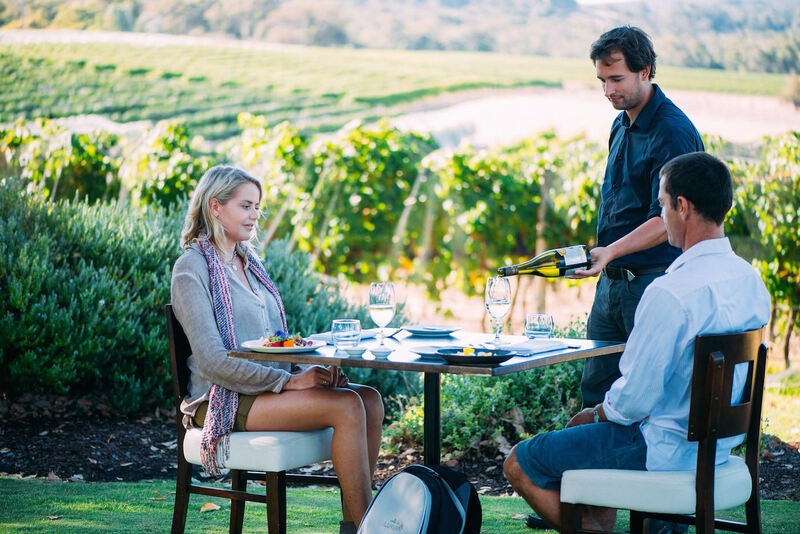 The 4 day Cape to Cape Walk, one of the Great Walks of Australia, is a complete luxury experience that showcases the best food and wine the region has to offer. The 135km Cape to Cape track runs through the Leeuwin-Naturaliste National Park, from Cape Naturaliste, Bunker Bay to Cape Leeuwin, Augusta. Scenery and terrain ranges from spectacular beaches and endless azure seas, limestone cliffs, sand dunes, rocky headlands and ridges, and towering karri forests. 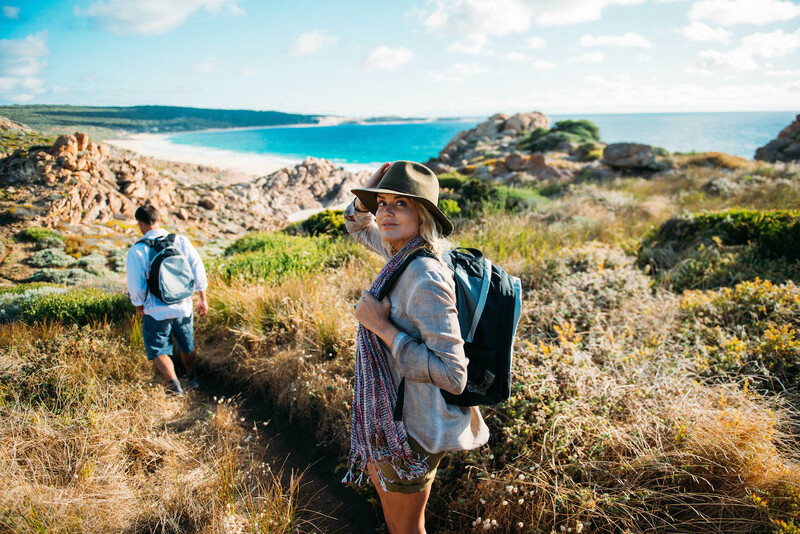 Enjoy spectacular walks of between three and five hours each day, along the most scenic sections of the track, then in the afternoons there is time to explore the pristine beaches and food and wine of the Margaret River region, and to relax in your luxury oceanfront accommodation. 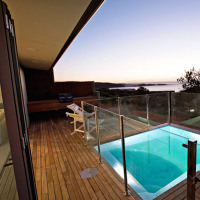 Indijup Spa Retreat is your luxurious home for 3 nights. Situated above one of the most beautiful beaches on the Cape to Cape track, this intimate coastal retreat offers spectacular ocean views. 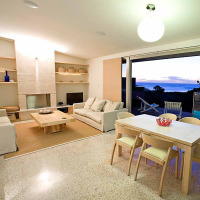 Each of the 10 luxury villas include a private deck with heated plunge pool and spacious living area with eco fireplace. During your stay at Injidup you are treated to a well deserved massage at Injidup Spa. 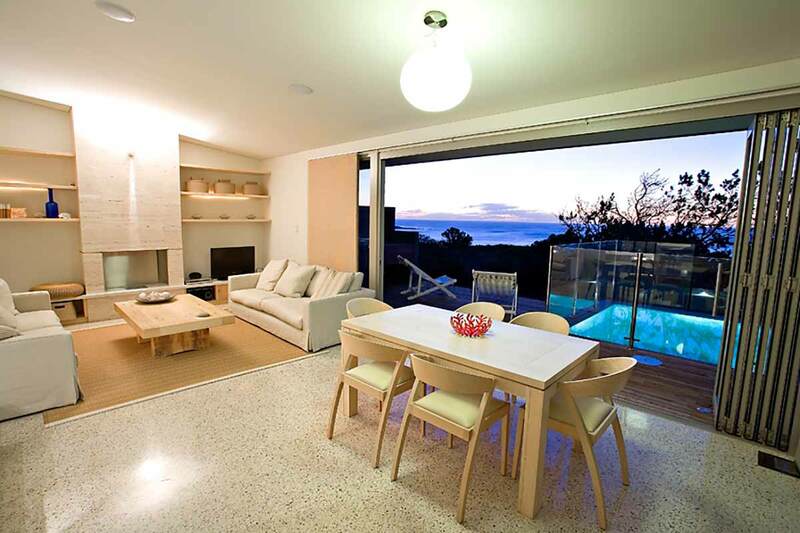 You will be accommodated in an ocean-view spa villa. The 4 day small group Cape to Cape Walk departs on Sundays. Arriving into Margaret River late morning, begin your first stunning walk along the Cape to Cape track, from Smith's Beach to Indijup Spa Retreat (5.5km). Enjoy lunch and a swim along the way. 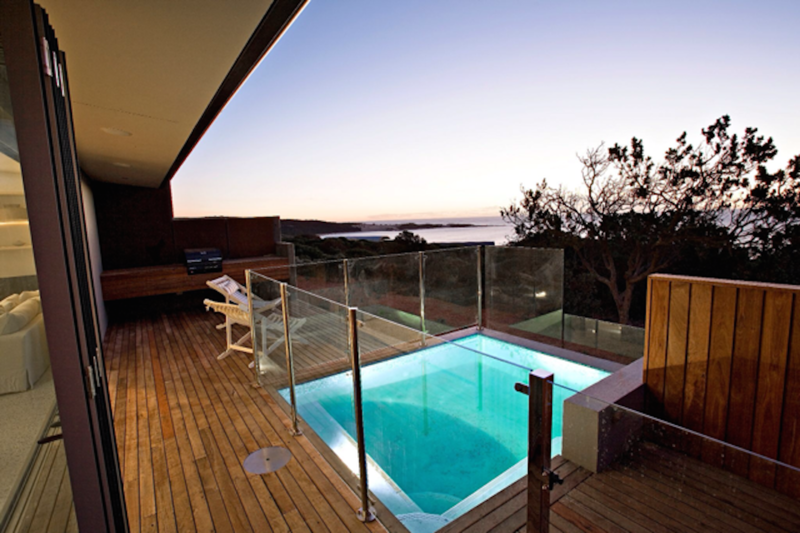 Upon arrival at your retreat, welcome drinks will be served on the cliff top overlooking the Indian Ocean. 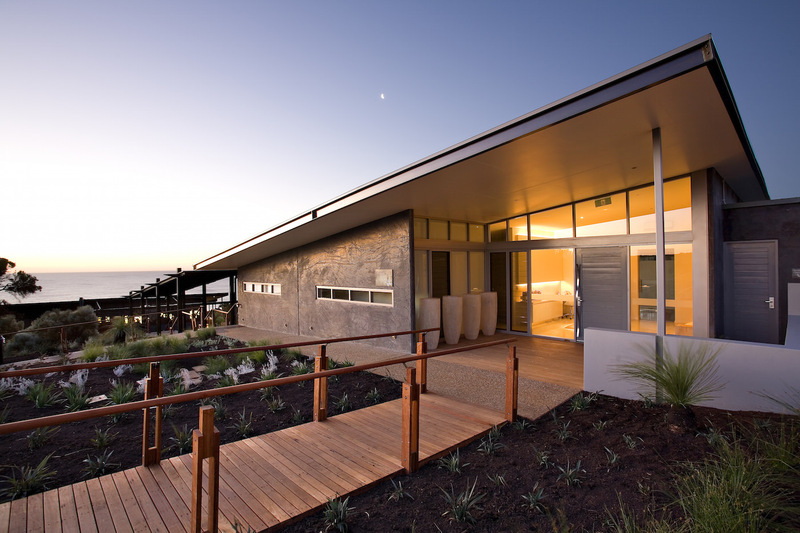 Later you will be transferred to a Margaret River winery for dinner overlooking the vines. 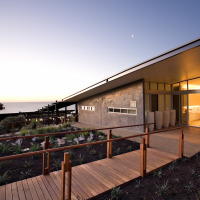 After a gourmet breakfast hamper in your villa, we will make our way to Cape Naturaliste stopping at Ngilgi Cave for a mesmerising didgeridoo performance and wlecome to country from one of the region's Aboriginal Traditional Owners. We will then walk along the limestone coastline to Yallingup with views of the world famous surf breaks along the way (14km). Retreat to your villa where you can enjoy a relaxing evening with a gourmet dinner hamper provided in your room. Today's walk, from Redgate Beach to Boranup Karri Forest, is arguably the most stunning (13.5km). 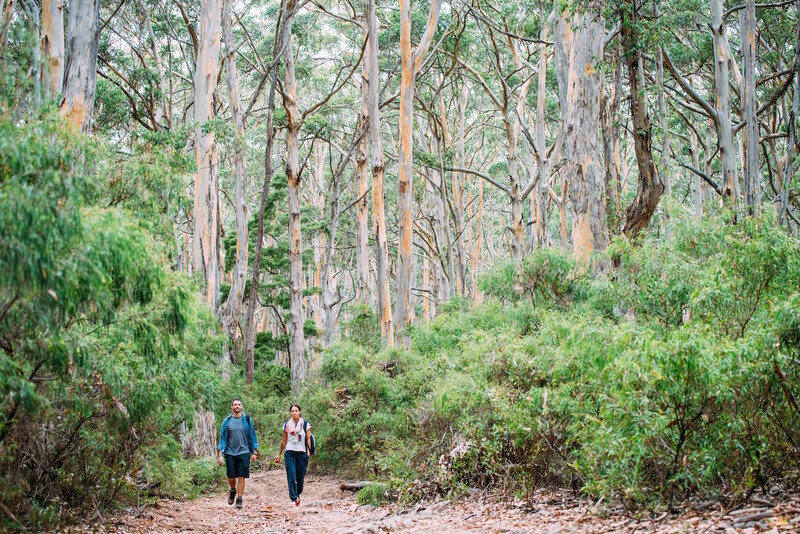 Feel a sense of awe as you are dwarfed by towering karri trees and as you take in the jaw-dropping views from the clifftop above Contos Beach. Return to the retreat where you will have some free time to relax before a provate chef and wine tasting dinner in the lounge. After one last gourmet breakfast in your villa, you will be transferred to Moses Rock for our final walk to Wilyabrup sea cliffs (8km). We will celebrate the completion of our walk in style at Wills Domain winery. Enjoy four courses with premium wine matches, overlooking vines and the Gunyulgulp Valley. Note: The above itinerary is indicative only and timings are subject to change. 1, 3 and 6 day Private walks are also available, as well as a 4 day Family walk. Contact us for more information. There is no right or wrong time to do the Cape to Cape walk, it just depends what type of climate you prefer and what you would like to experience on your walk. Summer (December – February) is hot and dry, so you may enjoy a dip in one of the many pristine beaches along the track, outside your accommodation or in your private plunge pool. Winter (June – August) is generally cool and wet. The dramatic cliffs along the Cape to Cape track are all the more spectacular when the wild winter waves are lashing the coast. If experiencing the full force of nature then retiring to a glass of red by the fire is your idea of a good holiday, then June to August will suit you. Spring and Autumn can vary between the two. The weather is still likely to be quite warm in November, March and April. September, October and May are generally milder, with the odd rainy day and the odd warm day thrown in. From June to November, Humpback and Southern Right Whales migrate along the coast. Spring offers spectacular wildflower shows, though this is also the busiest time along the track. Walk Into Luxury's Cape to Cape walks are designed so that any reasonably fit and healthy person can complete the sections covered each day. You do not need to be a serious hiker or to have gone on a walking holiday before to enjoy our walks. You will complete manageable sections of the Cape to Cape track, averaging between six and 12 kilometres per day, regardless of which walk you choose.